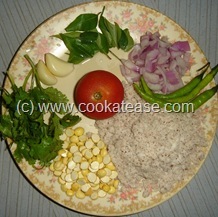 Here is a chutney by wet grinding tomato, coconut, garlic, green chilli, onion, coriander leaves, curry leaves. In my home, we call this as ‘Fusion Chutney’. All the ingredients used are fresh and no sautéing is involved. 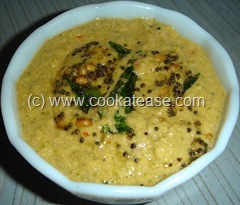 This chutney suits well with all south and north Indian snacks. The nice aroma and flavour of this chutney is liked by all in my family. Wet grind all ingredients together nicely, if needed add some water; do the seasoning. 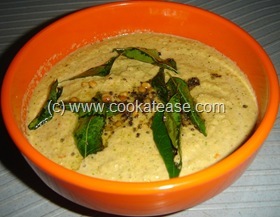 This delicious chutney suits with idly, dosa, poori, chappati, upma etc. Few mint leaves can also be added in this chutney. hmm definitely a fusion chutney.. Tried the chutney today and it was awesome! Thank you so much for such wonderful recipes. Cud u tell me what is this chutney dal…is it chana dal ?